It was announced that the Starz flagship, Spartacus, will be wrapping up after its third season entitled War of the Damned. We are in agreement with our partners in the decision to conclude the story after "War of the Damned," as we believe it is the best way to maintain the integrity of the series and secure its legacy. 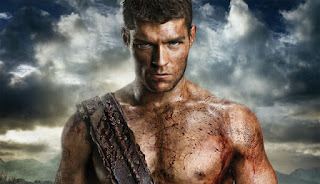 While everyone may know the fate of Spartacus, we believe this will be a spectacular season that will startle, amaze and honor the legions of fans. When I first read the news, I was extremely torn. On the one hand, the fact that this show's a historical drama means that there's only a finite amount of story to tell. Like Albrecht's quote mentions, history knows how the Spartacus story ends, and it was going to come to conclusion eventually. In a lot of ways, announcing that War of the Damned will be the final season gives Steven S. DeKnight and his crew an advantage because they know that an end is in sight, and he can wrap up the series in the fashion that he always wanted. Fans will know that this is it and will not have to worry about their favorite show being cut short which is always a blessing. Plus, we will not be subjected to endless wheel-spinning that has plagued other shows that were drained of all of its creative juices in favor of prolonging them to make more money. And to be honest, a show like Spartacus lasting three seasons (three and a half if you include Gods of the Arena) is nothing to scoff at, but will it be enough? As a fan, I want more. I know that I should be happy that the show had a good run and that we're going to be getting a concrete series finale, but I don't know if ten episodes will be enough to wrap up the story that DeKnight wants to tell. I'm sure he can condense everything into the allotted time, but I'm already afraid that things are going to be rushed and frantic. Sure, I should trust in DeKnight and his writers, and I do to an extent, but it feels like we're just scratching the surface of the Spartacus saga and ten more hours will not be enough to do the story justice. Also, I'm just greedy. I get so much pleasure from watching Spartacus that I don't want it to end so soon even though I understand the decision made by DeKnight and Starz.